Carrots of many colors photo is taken by Stephen Ausmus, this picture is featured as picture of the day on 12 July 2009 at the Wikimedia Commons. Agricultural Research Service (ARS) a United States Department of Agriculture research agency provided the colorful carrots. 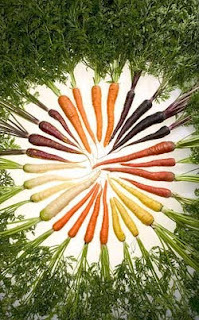 The carrots are selectively bred carrots that has certain pigments color. The selection of the photo object reflected almost all colors of the rainbow and creating a beautiful composition of shape and colors. This unique photograph takes another leap in the food photography by collecting a group of special object rather than using a common and easy to find object. The arrangements and grouping of colors creates a circular constellation adding a memorable impact on the photograph.